UPDATE: March tonight (3/18) in NYC! Converge at 8pm at the red cube across from Liberty Plaza. Show support for the dozens arrested and those beaten by police last night. We will not let police repression stop us! COME and share widely!!! Yesterday, on the 6-month anniversary of the original Occupation of Wall Street, #OWS went back to our origins. 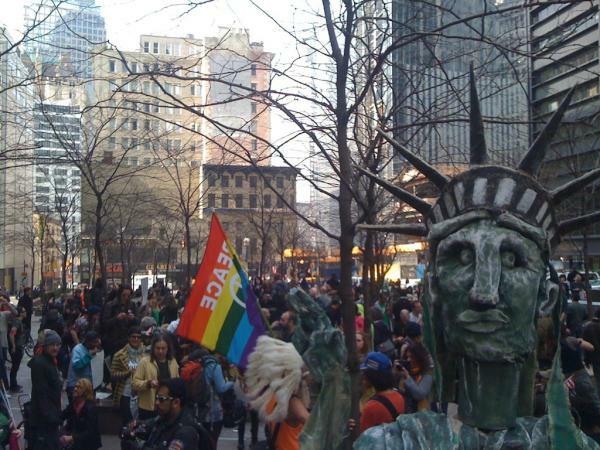 After a weekend of marches on Wall Street complete with spring training exercises, a St. Patrick´s Day march, street theater, floating tents, and dancing in the intersections, Liberty Square was re-occupied by thousands of Occupy supporters. Unfortunately, bringing back memories of November 15th, NYPD violently evicted us from our home once again while Occupiers were hugging old friends and celebrating the coming of spring in the park. According to the New York Times, ¨scores¨ were arrested, and more injured, during the attack. Police used city buses to corral mass-arrested protesters. Media were not allowed to cover the events. After clearing the Square, NYPD placed barricades around the area - an act specifically barred by previous legal action. At least one person was taken to the hospital on a stretcher. We have also heard reports of seizures and broken bones. On Livestream, peaceful protesters are seen being tackled, punched, stomped, choked, hit with batons, and thrown against cars for no reason other than sitting down to peacefully protest inequality in a public park. At around 3:40 minutes into the following video, watch as NYPD slams a medic´s head against a glass window and shatters it. Solidarity marches are planned for tonight (3/18) in Portland, Chicago, and elsewhere. For more detailed reporting on events as they unfolded last night, see full coverage at the Occupied Wall Street Journal. If you strike me down, I shall become more powerful than you could possibly imagine...Ideas can't be struck down but they become more powerful the more they are repressed. OWS is the idea that we can live without the banker-fellons, that we can take back our government, that we can rule ourselves with wisdom, dignity and efficiency, that those invested in the present corrupt system can be defeated and handed their walking papers. It is at it's core the belief that humanity can triumph over autocracy and greed. Very beautifully said HitGirl. You are my hew hero...Margaret Chase Smith used to be. What is it about those women who reside in New England...Warren...Smith...You...and my three daughters who were all raised in Vermont. You all seem to know that some things in life are worth fighting for, and you have more mettle than most guys. Wow! What a stunning statement of the right to human dignity! I'll have to copy this and put it on the wall. Funny...I had my doubts about posting it. "I had not a dispute but a disquisition, with Dilke on various subjects; several things dove-tailed in my mind, and at once it struck me what quality went to form a Man of Achievement, especially in Literature, and which Shakespeare possessed so enormously - I mean Negative Capability, that is, when a man is capable of being in uncertainties, mysteries, doubts, without any irritable reaching after fact and reason-Coleridge, for instance, would let go by a fine isolated verisimilitude caught from the Penetralium of mystery, from being incapable of remaining content with half-knowledge." The corrupt are not immune, they just think they are. The Police Violence is shocking but alas unsurprising. Throughout The U$A there are thousands of Cops who are "Impersonating Police Officers" but are actually just behaving like Paramilitary Goons !!! The Cops are the same as the rest of us but the 'Violent Thug Ratio' is far higher than in The 99% and The Militarised Cops have increasingly lost basic Policing & Peace-Keeping Skills in "The "WAR ON TERROR" over the last 10 years !! The "USA PATRIOT ACT" (1000+ pages - ready and prepared for 'Express Install' less than 1 month after 9/!!) has done N0thing to keep USers "safe from terror" - rather it has made an utter mockery of "The Bill of Rights" ! USA Patriot Act my grandma's patootie! It's the old "get them afraid and keep them afraid, and we'll sell them on the idea of this being the right thing to do in order to make everyone feel safe" thing. Remember when Tom Ridge was changing the alert status color every 4 hours? They assume everyone is as gutless as they are! That was from Family Guy! Nope the movement is decidedly Not Dead. Pull your head out you are experiencing delusions brought on by lack of oxygen. Many are much more objective than you are as to what this movement is really about and who/what it supports. Your whole existence is tied to this forum from the time you wake until you sleep. What better pursuit than the fall of corruption and the return of government to the service of The People for whom it was made. Besides slapping down trolls is fun. Even therapeutic. Anonymously arguing with, and insulting people, via the internet is exactly the therapy a powerless and fearful person needs. So that is why "you" are here? You have such a poor self image. Seek Help. It's why you and your kind are here. As shills for the DNC and to get your therapy by "slapping down trolls". Gumby Gumby gumby just because you say something - it does not make it so. If in your eyes the DNC is the reason to be here you are blind. Getting the government to serve the people is a non-partisan goal. Stopping corruption is a people's goal. If you do not want a healthy and prosperous world for all. Well then just say so. The DNC is the reason you are here. You simply want to tweak a few settings, not fix what is actually broken or even open your eyes to the root problem. Vote Obama, he doesn't want to address the root problem either and knows very well what that problem is, and will never tell you or any bi-party pawns. Here's to hoping Occupy camps the world over re-Occupy ... EVERYWHERE!! Is anybody paying attention to this? Consider that Bloomberg's and J.P.MORGAN'S NYPD == Not Your Police Department !!! Mercenary Cops are in The 99% too and we can love all sinners so long as they REPENT !! The 0.01% are incorrigible & Totally Untrustworthy as they seek to stifle any & all dissent !!! Good to see activity once again. "A few (tens of thousands) malcontents including labor unions, Occupy Wall Street, immigrant rights groups, artists, musicians, the unemployed, the foreclosed upon etc. plan to celebrate another set of possibilities on Mayday, May 1st 2012. If no march or celebration is scheduled for your town, make one happen. In New York, we meet at Union Square at 4:00 PM and march at 5:00 PM." Lets hope hundreds of thousands, and a nationwide strike! What the hell? Silly me, I thought we lived in a free country where we had a right to peaceful protest. Police violence in not acceptable. We need to hold them to account, both as an organization and individually. The police are acting like they did during the black's right movement. Also, its not the people blocking the streets, it is the police in the roads. Every act of violence and oppression by the police must be met by action on our part ( non-violent of course ). Eventually they'll accept the fact that they can't intimidate us. Don't want to burst anyone's bubble...I take that back. If you are touting the CONstitution as the solution I WANT to burst your bubble! The CONstitution was the enabling act for the 1% opulent minority. After the 'revolutionary war', the then independent colonies/countries/states formed an alliance under the Articles of Confederation. Less than a decade later, in response to Shay's Rebellion (the Occupy Movement of the era), traitors reinstated the British hierarchical system to grant privilege and protection to property owners. It was ugly. Study the reality and stop believing the grade-school indoctrination about the wonderful system of checks and balances. If there is no anarchy, there will always be a top. History shows that opressive force NEVER holds down a population. In fact, it, instead, encourages and fosters a VIOLENT revolution because the people are left with no protection and no other, ultimately, no other choice. P.S. To those of you who would argue that complying with public (and global) victimization via state policy, police brutality, government sanctioned and perpetuated theft of land, resources, freedom, etc. To you I say: "I feel sorry for you!" We're seeing screen names that we haven't seen in a couple of months here in this thread. Welcome back to the forum, guys! Thanks, I'm back :-). It's spring, let's go. I was looking at mainstream news this morning and, lo and behold, it never happened! Gee...that IS odd. They're usually all over any grist for the mill they can find. Oh, but wait! It was Saturday night...You know that nothing ever happens on Saturday night. Why bother? The police function, in an ideal direct democracy, should be rotational (everyone has to take turns doing police duty), with a small professional force for back up in case things get out of hand (staffed by people with at least a bachelors degree in sociology, in addition to the high level of tactical training required to deal with acute distress without a fear based response, which results in unnecessary harm). http://www.facebook.com/events/367259929973006/ Occupy Oakland is taking to the street in support! I am very sorry for the young woman that's ribs gotten broken and could not breathe. This should not happen. I covered on my blogs including Mayor Bloomberg king of NY. I don't excuse bad police behavior but I do want to remind you they are human and part of the 99 percent including the white shirts. I had to deal with them when I fought the uber rich folk folks of this specific area calling the police on vendors and we had a protest outside the mercer hotel where the worst offender Michael Rawson was in charge and called the police with regularity. Some of the vendors had positive experiences with the NYPD and it was the rich white folks putting pressure on them. I also called the unit sent down to Soho -- the Alpha Squad peddler's unit and the NYPD officer who answered the phone said the only reason they are there is the community is putting pressure on the NYPD. You need to take this to the community board and if they won't let you in protest outside. Although the very same community board may rule against NYU and Rudin luxury hospital condos boards they are very much in bed with them and if you research you can find out why. You need to go to the source and that includes Mike Bloomberg, team bloomberg and Christine Quinn his mini-me who they have funneled 3 million dollars to -- to prop as mayor so mike bloomberg and gang have a 4 and 5th term as mayor from the golf course. Quinn's community outreach nyc gov are all working on her campaign on nyc gov time is the rumor including Tony simone who hails originally from Goldman Sachs. What is a smoe from Goldman Sachs doing as a community liaison when he tells protests protesting corrupt Quinn to f..ck off but he was not punished because it was a fund raiser. There are fund raisers galore that Christine Qiunn is at every day trying to rub shoulders with celebrities. This tells you about Norman Siegel and I with two senior one handicapped community members going to City Hall to meet with Christine Quinn after I gave her a shout down from hell. She locked her own community members out from public testimony where they wanted to demand a hospital. The same NYPD that police you were there and although too large in presence they were good and respectful. I had been out for hours in the freezing cold so when a senior passed out from the cold this NYPD sgt. called 911 for me for the elderly man for an ambulance which took 28 min. across from City Hall near a hospital. You know hospitals are closing through NY but that is not a crisis like banks that get bail outs. You can contact me through Suzannahartist my youtube channel. I don't see responses here or answer them. I get locked out and I don't remember sign in hence the the play on my name. "Our eyebrows are lowered, our eyes closed, lips parched, teeth clenched, We walk with our back bent. We whom you rule over, lock us up in cages, flay us with staves. Let the skin of our backs fester! One day our eyebrows will arch. Our closed eyes will open again. Our puckered lips will throb and our clenched teeth grind. Rule over us until then. Flaunt your power over us." The park is empty now and will stay that way until a court order compels the police to reopen. There is an action being planned for 8:00 pm across the street. When will the people stand up to the police? They will continue to use violence against the peaceful until there is retaliation. I don't like the idea of violence, but these violent "peace officers" respond only to violence. Nonviolence is weakness to them. The occupiers need to organize their own police/security force. We have to keep it nonviolent or else the police will have cause to use live rounds on us, killing us instead of just injuring us. Much of America is a sleep but they are still reponsible for the criminal 1% action. Wake up blind patriots as you are a part of the problem. The crowd in Oakland's taunts against the police shocked me a little. I know there is a reason for animus, but the cops are only tools used to keep order. Only when the movement starts protesting exclusively in the neighborhoods of the .1% will things change. If you are going to taunt, you should taunt the right audience. The Founding Fathers were the economic powerhouses of their day and because they feared the angry mobs they utilized to win the American Revolution we have a Constitution and Bill of Rights today. The powers that are attempting to strip us of those rights need to be reminded not of our Power, but of their fear. Yes. The rich are not looking at the occupied parks. They would be looking if we were on their lawns. Have you always been such a sick puppy, or do you "force" it on yourself?? lol, very nice, Mr. Andrew B. McTroll. And someday when you get in that nasty traffic wreck and YOUR head goes through the glass, or you get stopped by a cop, move your hands a little too quickly and a hail of bullets goes flying through you, I hope that medic is the one who shows up to render you assistance (and finds out, while treating your serious injuries, that you wished him dead).